Saturday saw two openings in non-traditional venues, curated by artists once featured here on Arteaser. 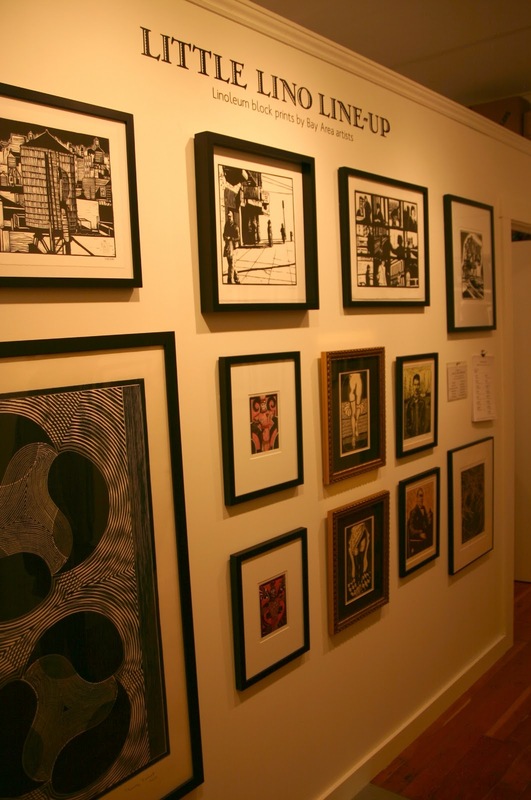 Freya Prowe's pop-up Slingshot Gallery (890 Valencia) features five artists, including Freya herself. As a set, the collection is heavy on symbolic imagery, figurative and otherwise, with stark black and white imagery casting a pensive tone. Although opening a week after Halloween, the show could have easily tied into the holiday's "scary" and "creepy" themes, from Angela Simione's haunting imagery and Kimberlee Koym's biogenous-looking installations and Meagan Donegan's floating sheep. In an upstairs apartment, Launa Bacon has created a "haunted house" of installations, playing with the domestic settings in her reflections on femininity, which also break with the achromatic theme of the downstairs show. 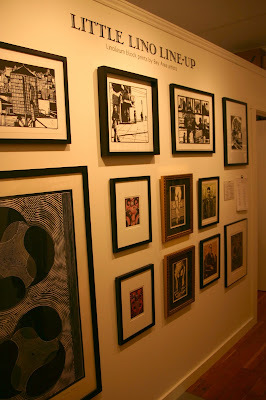 The gallery is open through January 2011, Thursday through Sunday 12pm-5pm, and by appointment. Heading over to Bar Basic, I caught up with Cindy Shih who has organized "Nevermind", a show about 90's pop culture nostalgia. Mike Kimball happened to be there, too. Here, Cindy deliberately curated a set of black and white (or sepia-toned) set of images to force a dated aesthetic to time that may still be vividly colorful in many minds. The hip-hop and pop culture references, from Nick Beery's rappers to Moo Tsungwei's surfing Yoda, feel at home in the understated contemporary bar, where appropriate musical accompaniment was on hand for the opening. "Nevermind" will be up through January 2011; Bar Basic is open evenings, Monday through Saturday. So, I know things have been lying fallow around here, but I just stopped buy the new Nieto Fine Art gallery to get a preview of the new States of Kinesis show opening tonight (565 Sutter from 6:30-8:30pm). I heard about the show months ago when discussing Fernando Reyes' work with Sharon Reaves out in New York. Fernando has several awesome paintings in the show, along with paintings from Eric Bailey and Peggy Gyulai. Fernando's work, of course, I know and love. This show focuses on his paintings and it's great to get to see his large works in the setting Nieto has launched in. In my view, his figurative nudes drive the "kinesis" of the show. Non-representational abstract work can be difficult to discuss, but a couple of Peggy Gyulai's pieces had that incalculable mix of color, texture, and balance that hit the spot. Eric Bailey's series was a joy to discover: at first, the formal composition of many of his works gives you the immediate impression of a Renaissance painting. The details, however, piece together a story of the sugary-sweet modern world juxtaposed against natural elements. I love how the notion of high/low culture permeates the collection, but without being vulgar. As usual, for more shows featuring artists profiled on Arteaser, check out the Arteaser Calendar. As usual, for more shows featuring artists profiled on Arteaser, check out the Arteaser Calendar. Also, get updates when new shows are added to the calendar by following the Arteaser Twitter feed of becoming a fan on Facebook!